Lubor On Tech: Can Social Software Ever Replace Email? According to Facebook’s COO Sheryl Sandberg, the year 2011 was supposed to be the year when email finally died. Or at least the year when email was taken over by social software. Yet it didn’t happen and we all still email today. Sure, there are kids out there sending each other messages via Facebook but nobody has given up their enterprise email in favor of Facebook yet. So, why is it that email isn’t dead? Well, it is because email has our share of attention. Email offers one-to-one or one-to-many communication which is what enterprises need and we are all programmed to go to our email several times a day to check what’s happening. Our email inbox serves not only as a communication terminal but also as a reminder of what to do next, what to put on our task list, what meetings to prepare for, and what’s going on. Email is a go-to destination and it gets our share of attention. Facebook is also a go-to destination. That’s one of the secrets behind Facebook’s success. We go to Facebook often several times a day to see what’s going on. Unfortunately, Facebook is a very consumer-oriented service and does not lend itself for enterprise use outside of marketing communications. In fact, many enterprises are rather paranoid about the possibility of their enterprise communication happening on Facebook. Twitter too is a go-to destination which gets our share of attention and Twitter has established itself for business use. But due to it’s one-to-all type of communication, it lacks the core concept of security - communication to those I chose and not those who happen to be listening right now. Is Google+ a go-to-destination? I’m not sure that’s happened yet and the jury seems to be still out. But given the growth in number of users, it is likely to happen. Is LinkedIn a go-to-destination? For some, perhaps. The LinkedIn features such as direct messages and private groups may even meet the one-to-one and one-to-many communication requirements of the enterprise but no company has switched off email in favor of LinkedIn yet. Or in favor of anything else, the recent PR coup by Atos notwithstanding. 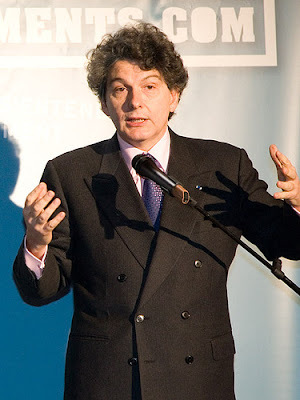 Thierry Breton, Atos CEO, recently banned email in his company. So, how about your enterprise deployment of social software? From what I am seeing, the adoption is very tribal today. There tend to be groups in the enterprise that embrace it and experience a high degree of adoption but also groups that ignore it. And herein lies the challenge of replacing email. What we like about email and social software is the fact that it enables asynchronous communication. The beauty of asynchronous communication is the fact that it is not disruptive. The challenge with synchronous communication such as the telephone, Skype, or even instant messaging is its disruptive nature that automatically limits the number of conversations possible. When I’m in a meeting, I can’t be on the phone. Email, on the other hand, can wait for me to respond. That works! For an asynchronous communication tool to be successful, it has to gain a share of our attention and significant adoption. Email not only has our attention, but it has reached a mind-blowing adoption that is nearly 100%. On top of that, email works the same across our professional and personal needs. We may use separate accounts but it works the same and when we make a mistake and cross the boundaries, it is usually forgiving. The share of attention and the high adoption make email a top go-to destination for all of us. Social software has the possibilities to get there, but it is a long row to hoe. Email didn’t reach its adoption in a day and not even in a year. Not long ago, managers used to have assistants to handle their email. It took our parents or grand-parents years to embrace email. Even today, email is subject to a relatively formal protocol starting with “Hello …” and ending with “Kind regards”. For better of worth, we have established rules about who can email whom and with what degree of urgency. We had to develop pretty solid spam filters to avoid being eaten alive by unwanted email. It took years and we did all of that to get the email adoption where it is today. On top of that, email has another useful feature. Since the mid 90s when email met the Internet, email addresses became universal identifiers. Your email address is usually a relatively simple derivative of your real name and yet uniquely and unambiguously identifies you. That’s why your email address is used as a login on a myriad of online services - from your bank to Facebook. All that has propelled email’s 100% adoption. 100% adoption, or even 80% adoption is not a small feat. Until any alternative communication technology gets there, we cannot talk about the death of email. As you say there is 100% adoption as it is platform-independent, and it is the only online medium that you can use to contact anyone - all you need is their email address. Most competitors require a relationship be first established, and most are also platform dependent. Predicting the demise of email seems akin to predicting the paperless office. Changes will happen over a long time-frame and for some things email will remain the best solution. I've been struggling to determine the internal corporate communication problem that exists, which is best solved by the continued proliferation of email. Like so many other forms of business content, "need more" isn't a problem email suffers from. It does make sense to me that communication with external parties (customers, vendors, suppliers, media, etc.) is well handled with the email paradigm. However, given all the other advancements in internal corporate communication medium, why is email still so sticky? Maybe it's because it feels "personal" or gives the reader and sender a sense of "ownership" of the content/information. Email was the best solution for the past 30 years. We've advanced in so many other areas, it's long amazed me that email is still the defacto platform for internal business communication. A recent article I read suggested that in 2012 email marketing would increase. Email still has a lot of advantages over social media messaging, one of which is it can be secured more readily. Social media has a larger disadvantage than standard email in that it is easy to get sidetracked into conversations that aren't about the task at hand. True, that can happen with email, but it's less likely. Email will be around for a while yet and for those of us who, like me sell email marketing software, that's a good thing. Email won't go away anytime soon. Email is integrated into all of our mission critical applications. ERP, CRM, etc. The integration is deep. Also every email is part of a communication "transaction". They have a beginning and an end, as a result they can be measured. Social software has a long way to go.